Ac is a comparison of a light source and a standard daylight (D65) effect on activating effect on human nervous system. Various types of light at a given illuminance have different effect on melatonin blood level and their impact on human cyrcadian rhythm is different. Ac of D65 daylight is 100. C(λ) is melatonin supression action spectrum sms(λ) according to DIN V 5031-100. 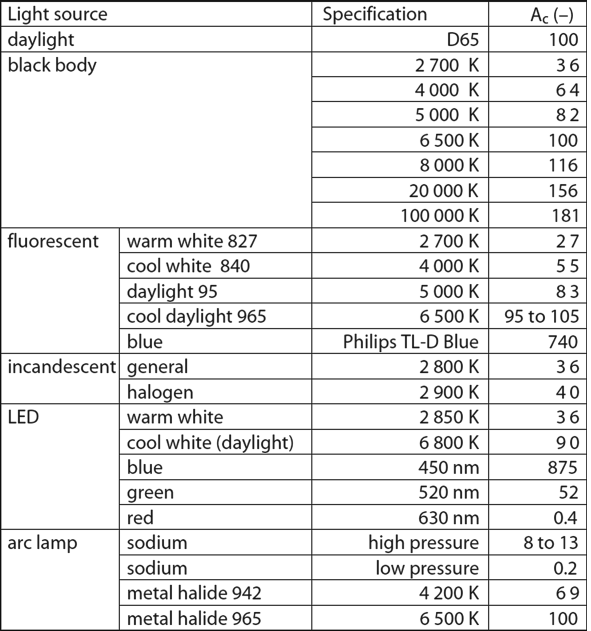 Examples of Ac values for various sources of light. GALL, Dietrich; LAPUENTE, Virginia. Beleuchtungsrelevante Aspekte bei der Auswahl eines förderlichen Lampenspektrums : Teil 1 & 2. DIN V 5031-100. Optical radioation physics and illuminating engineering: Prart 100: Non-visual effect of ocular light on human beings - Quantities, symbols and action spectra. Berlin: Deutsches Institut für Normung, 2009, 16 p. DIN V 5031-100:2009-06. IEC 50(845) Internation Electrotechnical Vocabulary: Chapter 845: Lighting. FUKSA, Antonín. Light and the Biological Clock. Světlo (light). 2010, nubmer 6, p. 56-58. English translation available online.